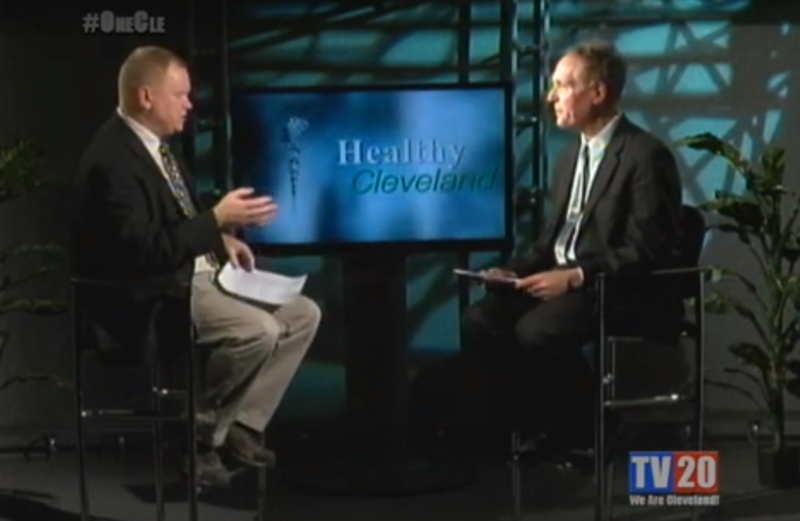 On today’s episode of Healthy Cleveland, TV20 host Dan Monroe sat down with Edward Leigh, Director of the Center for Healthcare Communications and Stage 3 Colorectal Cancer survivor to discuss Colorectal Cancer. Mr. Leigh was diagnosed with Stage 3 Colorectal Cancer in 1999, after dealing with symptoms for over two years. In his words he “ticked every box on the list of symptoms.” Symptoms of Colorectal Cancer include: abdominal pain, changes in bowel habits, constipation or diarrhea, unintended weight loss, anemia, and rectal bleeding. Mr. Leigh also made it a point to mention how his Colorectal Cancer would have been caught earlier had he received a colonoscopy and not a sigmoidoscopy. A colonoscopy is an extensive colon exam and is considered one of the most effective measures of detecting any form of colon cancer. A sigmoidoscopy is a similar procedure, but only examines about a third of the colon. When it comes to preparing and arranging checkups, Mr. Leigh said most people fall into two groups: average risk and at risk. Average risk individuals are anyone who have no history of Colorectal Cancer, no family history of Colorectal Cancer, and no history of inflammatory bowel disease. Individuals under this category should begin colon screenings at age 45. For those who do have a family history of Colorectal Cancer, Mr. Leigh explained that you should look to 1st degree family members, find whoever was diagnosed the youngest, subtract 10 from their age, and begin colon screenings at that age. So if a family member was diagnosed at age 25, colon screenings should begin at age 15. Finally, Mr. Leigh wanted to mentioned two Colorectal Cancer support organizations. Catch the full conversation on this episode of Healthy Cleveland, only on TV20, We Are Cleveland!